Enchanting description: Reanimate a weak dead body to fight for you for <dur> seconds. Reanimate revives the corpse of a targeted NPC. The corpse comes back to life and fights for the caster for the duration of the spell. The advantage of reanimated enemies is that there is a variety of enemies to reanimate as opposed to conjured creatures who have to be unlocked or bought individually. The unique Ahzidal's Necromancy enchantment available from Ahzidal's Ring of NecromancyDB changes the effects of your Reanimate spells when equipped. Reanimated corpses will be covered in frost and will explode for 50 points of Frost Damage the first time they take damage. This kills the zombie in the process, however. The average thrall groans while they are reanimated. Some NPCs with unique voice acting sets (such as Galmar Stone-Fist) do not groan at all in undead form. Anything that is reanimated turns into dust when killed or when the spell expires and cannot be reanimated a second time. The exceptions are creatures reanimated by Dead Thrall, The Ritual Stone power, or with staves, which leave normal corpses that can be reanimated again and again. The level cap of a reanimated undead target can be raised by 25% with Restoration perk Necromage. Decapitated enemies cannot be reanimated. Reanimated necromancers will not reanimate fallen enemies. NPCs with unique death quotes, when brought back by Dead Thrall, will sometimes repeat them when they die again—for instance, Amaund Motierre will repeat "But... we had a deal!" 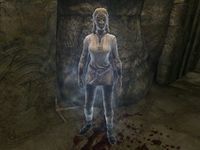 Conjuration XP gained by casting this spell is only attributed when the dead body is completely reanimated, and only when you and your thrall enter combat. You cannot access a reanimated NPC's inventory. With the Twin Souls perk, two NPCs may be reanimated at once. Casting cloak spells or transforming into a Vampire LordDG will dispel any thralls. Thralls may get lost. To remove the "Reanimate Thrall" active effect, get arrested, transform into a werewolf or vampire lord, or cast another temporary reanimation spell. Generic NPCs reanimated with the Dead Thrall spell that are then taken to a different cell and killed can cause another of their NPC type to spawn when the latter cell resets. ? Reanimated corpses or thralls may get stuck in some locations and may not go outside with you. To fix this, go back inside and find your thrall, open the console, and target your thrall—you should see their RefID. Do not click on anything else. Close the console, go outside, and open the console again to issue the command moveto player. Your thrall should now stand next to you. If you have more than one thrall, copy down all their RefIDs on a notepad, then use prid RefID moveto player. Player-reanimated zombies and thralls will occasionally die when transitioning to another area regardless of how much time is left, leaving unlootable ash piles in the new area. Reanimating the corpse of an enemy killed while under the effects of paralysis will cause the resulting thrall to remain walking on the spot, unable to move. They cannot be paralyzed, ignore combat, and are impervious to physical damage. This makes for a great way to train your combat skills on them, as they will only perish once the reanimation spell wears off. They are, however, still susceptible to destruction magic in this state, and you will not get experience for conjuration since they won't enter combat with you. On rare occasions, reanimated subjects will not disintegrate on death, giving you an opportunity to raise them again. Another rare event can take place, in which the subject immediately dies on reanimation. ? Reanimation spells used by NPCs may "fail" sometimes, adding the blue effect to the corpse, but they won't rise. However, when you try to raise the corpse yourself, it will immediately die once reanimated. ? This page was last modified on 30 March 2018, at 14:05.